Yesterday we finally got to see Kyrie Irving in the post-season as a member of the Celtics. He was vital in the 84-74 win over the Pacers, notching 20 points, five rebounds, seven assists and two critical steals - finishing with a plus/minus of +19. 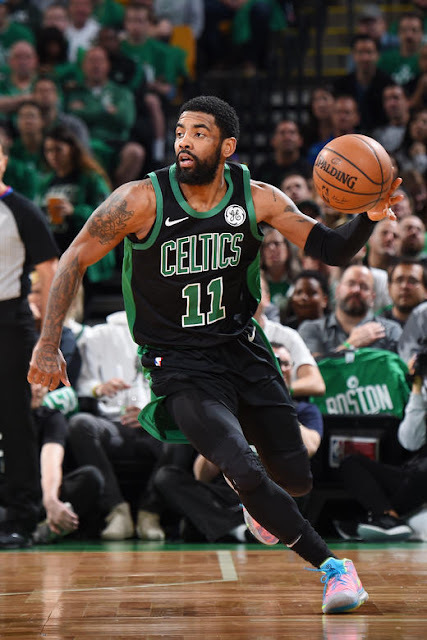 But his much-needed defense was on display in the second half when Boston went on a run after a dismal first two quarters. Kyrie has commented how Marcus Smart-as-starter has helped Irving's game, but with Marcus out with an injury, Kyrie is making sure he has a major impact at both ends of the court. Irving is known for his lightning-quick reactions on offense, but we got to see some of that on the defensive end in this game. His speed, great hands and anticipation can be seen in his two steals. For a guy that has been criticized in the past for sometimes relaxing on defense, he was everywhere last night in the second half. The guys in green don't play again until Wednesday night. The Celtics seemed to be slightly complacent at the start of Game One, but they quickly recovered, and the greater talent prevailed. They may get away with that when playing Indiana, but it won't work against Milwaukee, assuming they get there. Look for the Celtics to match Indiana's first-half intensity on Wednesday for Game Two. And look for Kyrie to set the tone on both offense and defense - right out of the gate.